Few innovations in the RV industry can boast of steady interest over an extended period of time and at many levels of the industry. But along with other leading-edge design concepts such as basement model floor plans and slide-out rooms, the advent of EPDM rubber roofing has generated a lot of interest and a box full of questions regarding its wear, its care and its benefits. Equipped on RVs since the 80's, EPDM rubber, (ethylene propylene diene monomer), has now enjoyed industry-wide acceptance on many recreation vehicles and many decades of successful use in other industries. 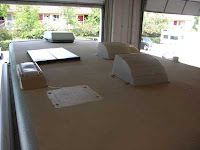 So popular now, most RV manufacturers offer at least some of their product line, if not all, equipped with an EPDM rubber membrane as the finished roof surface. As EPDM membrane increased in popularity and RVers became more in tune with it, aftermarket products began to appear including a vast assortment of treatments, cleaners and protectants. And that's where the contention began. Confusion seeped its way into the fabric of discussions from campfire conversations among RV owners to professional technical presentations by the so-called experts. Even knowledgeable professional shops were a bit vague when asked about specific precautions concerning EPDM membrane. The facts will be revealed here, but first, a little EPDM background. According to a published polymer selection guide spec sheet, EPDM membrane is ideal for outdoor applications, such as the roofs of RVs because it has an excellent resistance to ultra-violet light, (UV), ozone, oxidants and can withstand severe weather conditions. Such characteristics allow many EPDM manufacturers to guarantee their membrane for long periods - ten to twelve years. Realistically, EPDM membrane could last closer to twenty! Additionally it has excellent resistance to heat which makes it extremely well-suited for recreation vehicles in any climate. It is capable of enduring temperature variations from -50 degrees F., to 240 degrees F., without cracking or deteriorating. Its sunlight aging rating is excellent. Compression set, abrasion resistance and its resilience factors have all been rated good. On the downside though, tear resistance only came in at fair, and the solvent and oil resistance rating is poor. Many RVers have experienced tears or rips in the rubber caused primarily by low hanging tree limbs while pulling into campsites. Happily though, repairs are likewise easy, thanks to the aforementioned aftermarket. Other inherent negative characteristics include a susceptibility to absorb oils, fats and waxes from solvents having a low polarity. An example would be the resultant bubbling or wrinkling that can occur if an oil-based roof coating, commonly used on aluminum RV roofs, is mistakenly applied to EPDM membrane. By nature, EPDM rubber requires no protection from UV rays or ozone bombardment, though it is prone to oxidize. Normal oxidation is a condition due to the disintegration of surface binders or elastomers simply by weathering. Other destructive environmental conditions can also add to the degree of chalking. The result is that surface chalking actually removes a portion of the rubber. This is a normal occurrence and the RVer should not be concerned about the direct effect on the rubber. Oxidation will, however, usually manifest itself as long, unsightly streaks running down the sides of the RV. We've all seen it. The streaks are usually caused by dirt, road grime and air-borne pollutants that settle and adhere to the roof and are washed over the side along with the loosened powdery surface elastomer. The simple solution is to keep the roof clean. The degree of chalking associated with EPDM may vary from coach to coach. And according to the makers, tighter controls during the copolymerizing procedure leads to a slower rate of oxidation though most will surrender up to 10% of the overall thickness during the life of the roof. Since EPDM is itself an elastomer used generally in conjunction with other elastomers, copolymerizing the EPDM with other modifiers can substantially improve the quality. But that's for the manufacturers to worry about. Cleaning your rubber roof should be a regularly scheduled maintenance task performed often enough to keep the EPDM surface white. Usually four to six times per year will suffice depending on your climate and its propensity to gather and distribute dirt, and how pure the copolymerizing process was performed during manufacture. One confusing aspect of EPDM care, alluded to earlier, involves the use of products that contain petroleum distillates. It appears the very words, "petroleum distillates" invoke confusion and controversy. EPDM, as designed and formulated by the chemists and engineers, has a poor resistance to oils and solvents - derivatives of petroleum, but many, if not most, of the aftermarket cleaners and protectants are forever branded with the words, "Contains: Petroleum Distillates" right on the container. So what gives? When asked about the apparent contradiction, many product manufacturers were quick to respond and ready to defend. Read on. According to most, the term "petroleum distillates" is a very broad category which usually refers to all aliphatic hydrocarbons. Further, aliphatic hydrocarbons can be divided into two distinct groups: petroleum distillates and synthetic paraffinic hydrocarbons. Not that it will impact your RV life immensely, but the three general classes of compounds found in petroleum distillates include napthenic, aromatic and paraffinic hydrocarbons. All petroleum distillates and paraffinic hydrocarbons are good cleaners and spot removers though the paraffinic hydrocarbons have a lower flammability level, a narrower boiling range and a higher solvency rate. They all are very good at removing light grease and grime common to the roofs of RVs. Further purified, some distillates eventually become oils used in medicines and cooking aids. Proponents say trying to define the term petroleum distillates is akin to explaining the term, "liquids." Liquids come in many varieties; water, milk, battery electrolyte, gasoline, cough medicine and nail polish can all be described as liquids, and each has a beneficial use when used correctly. However, nail polish used as battery electrolyte or milk poured in your RVs fuel tank will indeed have disastrous results. Fact is, all petroleum distillates begin their refined life as a petroleum distillate, but their end use can be radically different. This is not to trivialize the concern about some petroleum-based products with respect to EPDM membrane, but broad-brush tactics condemning all petroleum distillate products as the death knell to EPDM rubber roofing is like throwing the baby out with the bath water. One EPDM manufacturer even recommends the use of unleaded gasoline as a cleaning solvent though admonishing, "Use cleaning solvent sparingly. Do not saturate sheet. 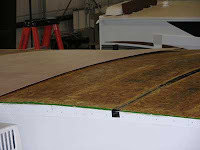 Noticeable swelling of sheet indicates that too much cleaning solvent is being used." Makes sense. Additionally, industrial splice cleaners used by some makers, including Carlisle SynTec and Anjon, contain petroleum distillates. Immersion tests have revealed that petroleum distillates indeed cause EPDM to swell, wrinkle and bubble, but in the case of volatile solvents, the swelling can recover as the solvent evaporates. In other words, take care and know what you are doing if you use petroleum distillate products on EPDM membrane. Your rubber roof material will bubble and loosen if it is saturated or soaked with a product that contains petroleum distillates. But, this harkens back to a common theme among those EPDM product manufacturers who use petroleum distillates in their mix; they say in essence, look, we have done our research, spent big bucks to formulate a product that will do what it says if you simply follow the directions properly. We have to put the words "petroleum distillates" on the label as a notification for physicians and emergency medical specialists in the unlikely event of ingestion of our product. Prominence in labeling is a requirement of the Consumer Product Safety Commission and the Code of Federal Regulations, Commercial Practices, Section Sixteen. (Copies of the regulations are available by contacting Superintendent of Documents, PO Box 371954, Pittsburgh, PA 15250-7954). So the call went out to product manufacturers and EPDM suppliers and distributors for information, product samples and maintenance recommendations. 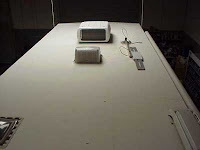 Samples, when provided, were tested from a user's perspective in various climates over the course of many months. What follows is a list of the products that were effective on EPDM rubber membrane displaying variable degrees of oxidation and sporting an assortment of stains and dirt. What mattered? Just this - did the product do what it said it would do. An interesting note is that other factors also contributed to a product's effectiveness including the time of year and how well the roof had been previously maintained. But the type of stain, the indigenous climate and how much oxidation was present were the three main determining factors. Application directions were followed to the "T" though none were compared head to head for ease of use since that comparison would be purely subjective. Interestingly, there were no reports of swelling, bubbling or damage caused by the use of a rubber roof cleaner or protectant that contained petroleum distillates. One cleaning tactic that continues to work on tough stains, previously endorsed by virtually all EPDM suppliers, is to dampen a clean cloth with mineral spirits, (a petroleum distillate), for spot applications. However, do not pour mineral spirits directly onto the roof; remember the saturation factor. Another product evaluator had success simply with Tile-X mildew cleaner, a bleach-type product, though it remains unclear exactly what type of stain was on the roof. Simple household bleach worked well in other instances. Dicor recommends their own cleaner or a mild laundry detergent for general cleaning and mineral spirits for the tougher stains. Ironically, Alpha Systems Incorporated, another major EPDM supplier, choose not to respond to two separate requests for information and their recommendations. Yet a dichotomy still exists. Fact; warranties can be voided by using products that contain petroleum distillates if damage is incurred by its use. Fact; when used as directed, EPDM products containing petroleum distillates do work. So just where does that leave the RV owner? It beckons the RVer to try an assortment of care products and make a personal observation and decision based on his/her climate and type of grime. In other words, use what works best in your situation taking care to follow the directions explicitly. Be also advised that your warranty may be affected by using products that contain petroleum distillates. It just may come down to how well you want the roof to look, how easy it is to clean, and if the risk of voiding the warranty means less to you than keeping your EPDM rubber roof membrane spotless.